From an early age I was drawn to music. I was inspired by it, I was moved by it, I felt connected to it, and it became a reflection of who I was. I enjoy sharing my enthusiasm and fascination of making music with others. I believe teaching and learning are two important activities that people participate in. My passion for learning fuels my pursuit of teaching excellence and my dedication to helping students gain wisdom. While gaining wisdom takes a lifetime, I am constantly seeking out new information to better help equip me as a teacher who imparts knowledge and influences thinking. Whether you aspire to major in music, be a professional flute player or just play flute as a hobby, I am happy to share my knowledge and expertise with you on your musical journey. Learning a musical instrument teaches lessons beyond merely the ability to play a physical instrument; it imparts discipline, patience, and dedication. There is no age limit when it comes to enjoying or engaging in music. Learning music is a life-long endeavor. I strive to form well rounded musicians, whether they are professionals or amateurs. I emphasize essential skills during lessons including: sight reading, music theory, and basic music history. I encourage students to attend recitals and concerts outside of lessons as well as perform in studio recitals. Additionally, Students are encouraged to participate in solo and ensemble festivals and compete in private competitions. 1. Lesson fees are to be paid monthly at or before the first lesson of the month, unless other arrangements have been made. Payments may be made by cash, check, or through PayPal. 2. By scheduling lessons with me you are reserving a time slot in my schedule and agree to make payment for the reserved time slot whether you attend the lesson or not. If you need to cancel a lesson for any reason, it must be done with a minimum of 24 hours notice so that the time slot can be used by another student. I will make exceptions for emergencies. Please avoid skipping lessons whenever possible, as skipping lessons causes a quick regression in skills. 3. Lessons missed without notification will be paid in full. 4. If I have to cancel a lesson for any reason, I will always offer a time to make up the missed lesson. 5. If you arrive late to your lesson, it is likely that I will have to conclude the lesson at the previously scheduled time to accommodate lessons that follow. 7. Lessons are not "practice sessions". Students are expected to practice the assigned materials between lessons. During lessons I share effective ways to practice so that students can practice efficiently on their own. 8. I am happy to help students with band and orchestra music as well as audition materials. If you think it would helpful to have an extra lesson, please ask! 9. I like to keep communication open between all parties. If you have questions, observations, or suggestions please don't hesitate to let me know. "It is a joy to study flute with Leighann. 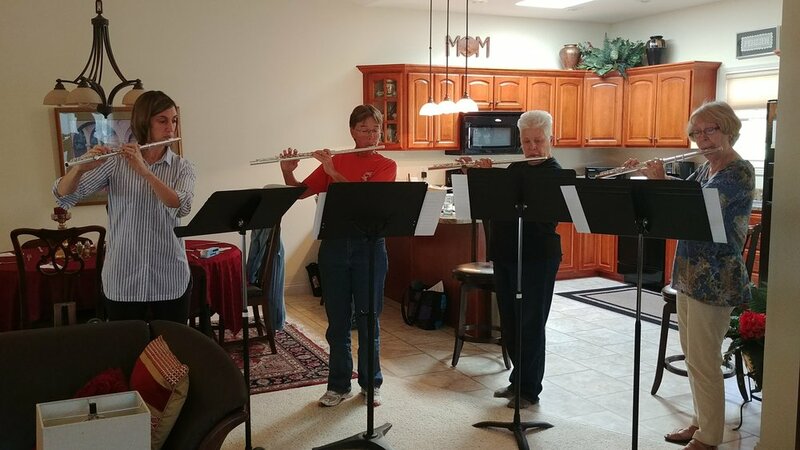 As a senior citizen who hadn't played the flute in about 50 years, I knew I needed someone patient and competent and Leighann has been just that teacher. She's particular about details and doesn't settle for sloppy playing while at the same time is very generous with moral support and patience. I couldn't ask for a better teacher!"